The year is more than halfway over – where are you stuck? What’s holding you back from achieving those big goals you’ve been working towards? When you’re facing a roadblock in your business, it’s easy to get caught in your own head and not see the way out. We believe that every problem has a solution, and we’re here to provide an outside perspective to help you kick down the roadblocks that are standing in the way of your success. 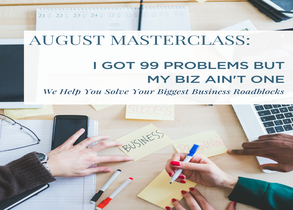 At this master class, we’ll be going over some of the most common business problems that our clients run into. We also want you to bring us your biggest business problems, and we’ll strategize creative solutions to help you figure it out. This master class is an incredible opportunity to learn from the best and get personalized business strategy advice. You’ll walk away with a fresh perspective and solutions to the business problems that have been nagging you for months or years.